This calculator will help you decide whether an auto loan or a home equity loan is the best option for financing your next vehicle purchase. First enter the car’s purchase price, your down payment amount, and the loan term. Then enter the interest rates for both a prospective auto loan and a home equity loan. Finish up by including upfront costs for the home equity loan, along with your combined federal and state tax rate. When you push CALCULATE, you’ll see a side-by-side breakdown that will lead you to the most affordable option. After the passage of the 2017 Tax Cuts and Jobs Act tax breaks associated with a second mortgage typically require the home equity loan or HELOC debt to be used to build or substantially improve the property securing the debt. If the HELOC is used for another purpose, in most cases the associated tax breaks do not apply. If you are claiming this tax deduction, make sure you keep your receipts. the IRS said that despite newly-enacted restrictions on home mortgages, taxpayers can often still deduct interest on a home equity loan, home equity line of credit (HELOC) or second mortgage, regardless of how the loan is labelled. The Tax Cuts and Jobs Act of 2017, enacted Dec. 22, suspends from 2018 until 2026 the deduction for interest paid on home equity loans and lines of credit, unless they are used to buy, build or substantially improve the taxpayer’s home that secures the loan. Under the new law, for example, interest on a home equity loan used to build an addition to an existing home is typically deductible, while interest on the same loan used to pay personal living expenses, such as credit card debts, is not. A home equity loan consists of funds granted by a lender based on the value you have built up into your home. Generally, this is done through paying down your debt, but it is potentially related to the rising market value of your property, as well. In most cases, such lines of credit are given to homeowners looking to upgrade, renovate, expand, or otherwise improve their property with the intent of using the money to make a home more livable and/or further increase its property value. In other words, you stand to get back some or all of the money you put in, and sometimes more, depending on the changes you've made, how soon you sell, and the state of the housing market at the time. But there are, of course, other uses for your home’s equity. If you're looking to buy a new vehicle, for example, you could borrow the money from your home, so to speak, instead of seeking more traditional forms of vehicle financing. But why would you want to go this route? When you compare these two types of lending, you'll see that there are instances in which using your home’s value to your advantage could be the better choice. Here are some things to consider when deciding which avenue is right for you. When you start shopping around for vehicle financing, you'll find that you have many options to consider. You could, for example, finance this major purchase through a bank, a credit union where you are a member, or the dealership. And all of these are fairly traditional means of funding your purchase. Each form of lending will come with its inherent benefits and drawbacks. Financing through dealerships will likely be the easiest. After all, they have agreements in place with lenders to provide you with low-interest financing and they do all the work of putting the pieces in place. So all you have to do is sign on the dotted line. On the other hand, while a bank may be more willing to work with credit issues, a credit union is likely to offer the lowest available rates. So where does financing based on the value of your property fit in? In truth, it is just another form of lending - one that you should add to your list. And the main reason is that you could enjoy better rates than you're able to nail down elsewhere. But you'll have to comparison shop to find out for sure. You probably already know that you’re eligible to deduct the interest payments on your monthly mortgage when you file your annual taxes. And you may also know that the interest payments on your car debt don’t enjoy the same status. But when you roll the cost of your car in with your mortgage, you could reap the rewards of doing so by saving on the interest payments attached to this form of lending. Simply because it is attached to your primary residence, you can deduct whatever interest you pay towards the money borrowed. You'll have to run some calculations (or better yet, have your financial guru or tax prep specialist do it for you), but tying your vehicle purchase to your mortgage could net you both lower interest rates and tax deductions. Owning property can improve your credit score, especially if you make mortgage payments in full and on time. 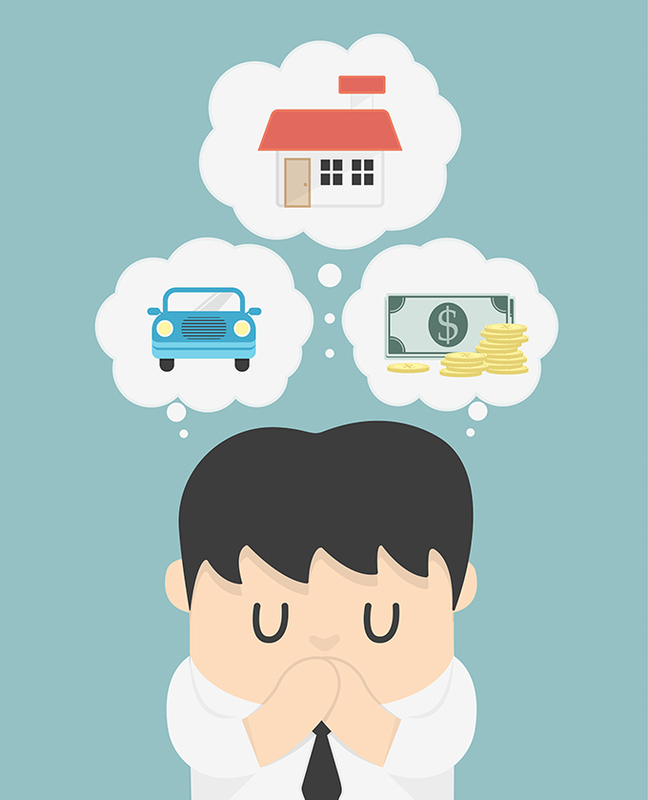 Of course, simply owning a house doesn't mean you’re capable of maintaining a good credit score, and this could impact your ability to get financing when you find yourself in need of a new vehicle. Securing funds through a lender can be difficult at the best of times, but when a poor credit score gets in the way, it can be downright impossible. A line of credit based on your home’s value, however, may not be as difficult to secure since you're basically using the money you've put into your house as collateral. Based on your ownership of valued property, the end result may be that you are able to get the funds you need. On the other hand, securing standard financing could be beyond your reach due to your credit history. Although there are many potential benefits of using a line of credit to finance your vehicle purchase, there are also some drawbacks to consider. For one thing, this type of lending constitutes a lien on your property. In essence, this means that the money owed will be collected should you decide to sell your property. So if you’re forced to sell at a loss due to pre-foreclosure, an unavoidable move, or other circumstances, you'll still owe that money. On the upside, you'll own your car. After all, you’re essentially tacking the sticker price onto your mortgage and paying off the car dealer in full at the time of purchase. But having a lien in place can make selling your home more difficult in some cases, so it bears consideration before you make a decision. When you take out a line of credit associated with your property, the terms for repayment generally coincide with the length of your remaining mortgage payments. And before you pull the trigger on this lending arrangement, you need to understand what this means in practical terms. The standard term for vehicle financing is five years, although you could select slightly shorter or longer terms for your contract. The term for your home’s line of credit could be close to thirty years, depending on your mortgage and how long you've owned the property. So even if you secure a lower interest rate and tax deductions for your vehicle purchase in the process, the sheer number of interest payments could leave you spending a lot more in the long run. Unless there are other reasons for going this route (like poor credit), you should seriously consider whether it's the wisest choice by running calculations to determine what you'll ultimately end up paying for your vehicle purchase.